Christmas trees are a staple feature in many homes around the end of the year, along with stockings, wood fires, and hot cocoa. All of these are fitting for a visit from the frigid North Pole, but in the southern hemisphere the weather is more appropriate for barbecues on the beach. 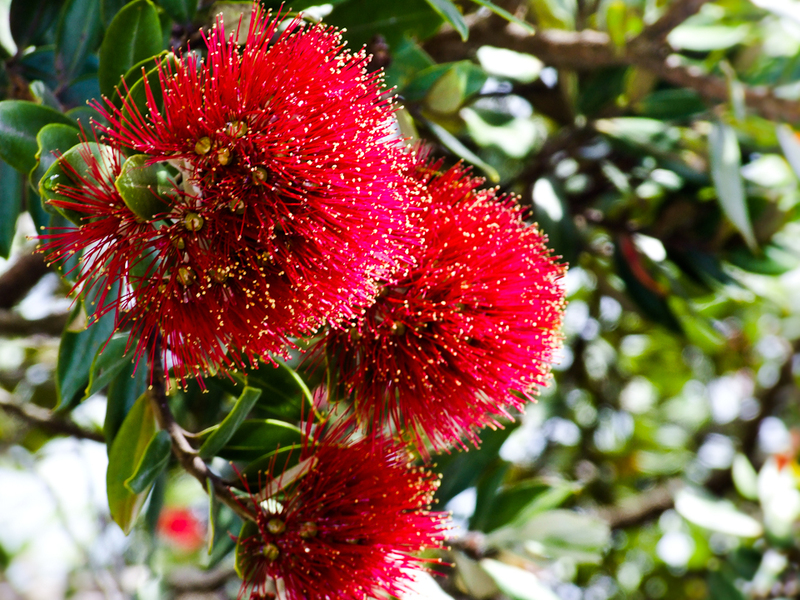 In New Zealand, residents have taken advantage of the early summer weather by adopting a particularly festive local tree (Pohutukawa) as the symbol for Christmas on the island. Much like the island’s kauri trees, pohutukawa (metrosideros excelsa) are venerated by the first humans to arrive on the island, the Maori. In fact, the tree plays one of the most important roles in their journey into the afterlife. 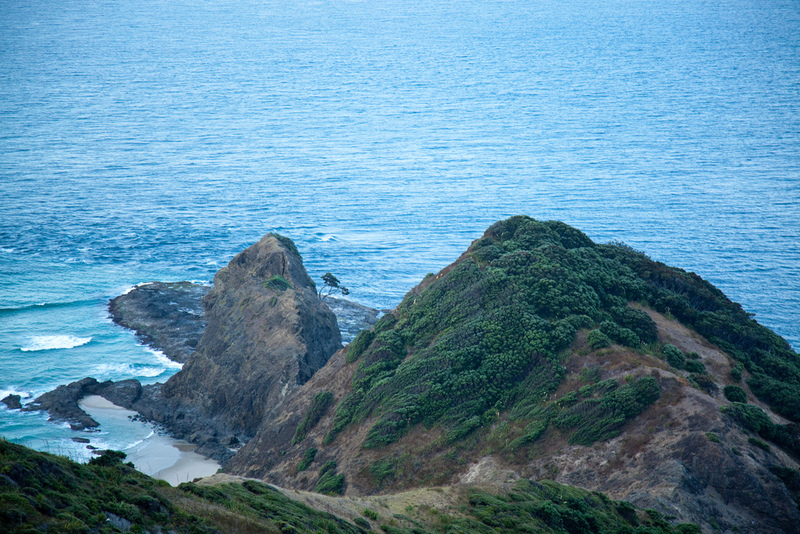 On Cape Reinga, a single tree has beaten the odds by surviving on a harsh cliffside with ocean waves crashing below. It is said that recently departed spirits first travel here to climb down the roots of this tree into the sea, where they will begin their voyage through the underworld (reinga). This has earned it the gloomy name ‘place of leaping’. The tree itself is quite small and supposedly has never blossomed, but it is said to be more than 800 years old. 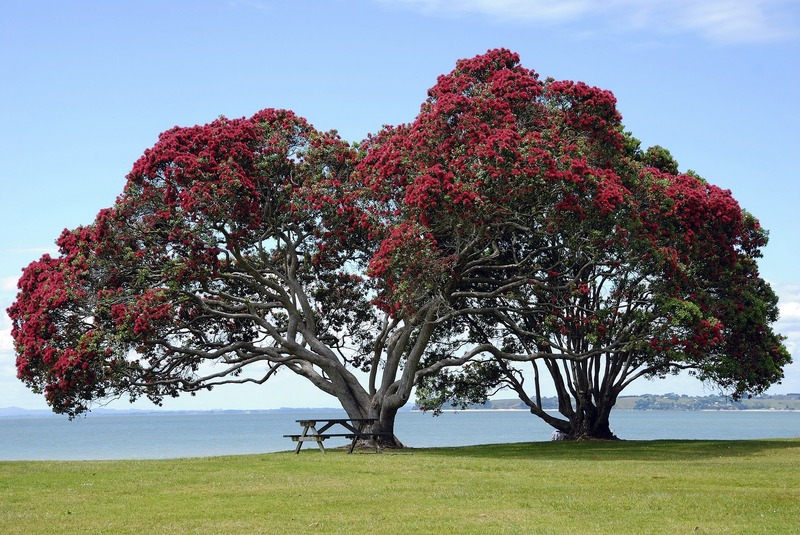 Another Maori legend says that a young warrior named Tawhaki died while attempting to get to heaven to seek help from the gods, and his blood spilled onto the pohutukawa tree as he fell, giving its flowers their distinctive crimson red color. The flowers aren’t only red, however, and are also known to blossom white, yellow, and orange. When the first European settlers celebrated their first Christmas, they were forced to do so without the characteristic holly decorating their churches and homes. 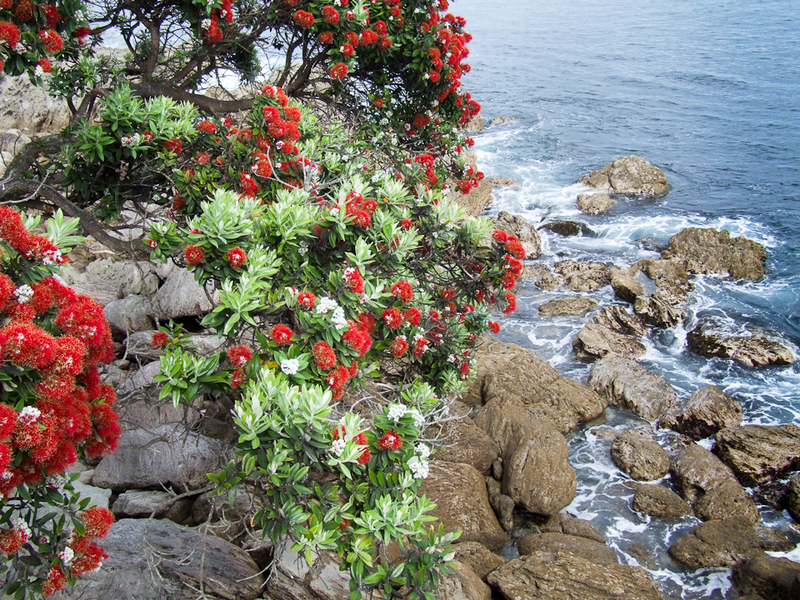 Pohutukawa trees, with their red summer blooming flowers, made a perfect alternative. It was referred to as the ‘Settlers Christmas tree’ and ‘Antipodean holly’. On Christmas-day the well known Chief Patuone gave his customary feast to his native friends, at his residence Waiwharariki; North Shore… A large tent had been erected for the accommodation of the guests, 120 feet long through the entire length of which rude tables and benches were ranged; the sides were tastefully decorated with flags, branches, and flowers of the scarlet Pohutukawa, -or ‘Christmas Tree,’ and at each end was hoisted the Union Jack, as an acknowledgement of their being loyal subjects of Her Majesty. Her Majesty, for her own part, seems to have taken a liking to the nectar of the trees as well. Queen Elizabeth II reportedly received a jar as a gift, and requested another each year. It is said to have medicinal properties, and is used like honey to soothe sore throats. The bark of the tree is also useful, and was a traditional folk medicine for dysentery and diarrhea. The timber is highly prized, with a dense red heartwood with beautiful grain patterns. However, it isn’t harvested much due to its status on the island as ‘under threat’. The charitable organization Project Crimson is hard at work to preserve the endemic tree. Today, the tree is well known as the Kiwi Christmas Tree, and serves as a symbol for the holiday season for Kiwis at home and abroad. The trees can be found in other places around the world, like San Francisco, where their roots can cause problems with sewer systems, South Africa, where they are seen as an invasive species to be eliminated, and even the Spanish city of La Coruña, where it has been named the floral emblem of the city. Even so, it will always hold a special place in the hearts of New Zealanders. If you enjoyed this article about the Kiwi Christmas Tree, check out the archive for more tree stories. Also check out the new Facebook page, with a few extra tree goodies throughout the week. Subscribe below to receive notifications whenever a new tree story is published. We know it as the New Zealand Christmas tree. The only big specimens I know of are in Golden Gate Park in San Francisco. They are excellent street trees in coastal areas because they are complaisant with surface pavement, and resilient to coastal conditions. The bloom in summer here of course. It’s a shame that such beautiful trees can be considered pests, but I guess that’s just how things go! I need to have a look around Malaga and see if I can find any. I’m sure they would grow well here. I like the gentle respectful tone of your writing, as well as the interesting descriptions and facts. They are having a spectacular blooming period this year in my home city of Wellington (NZ), due to an early and particularly warm summer. Oddly, all trees seem to flower quite randomly and independently of other trees in the vicinity, so you can have one tree in full bloom and the one next to it looking quite bare. In regards to causing drain problems, yes, I have experienced this myself with broken clay pipes. These trees tend to be water seekers – they will follow a small water source and, if this happens to be from a pipe, their roots will break into the pipe and cause blockages.